The dive sites in Siquijor all located all around the island. 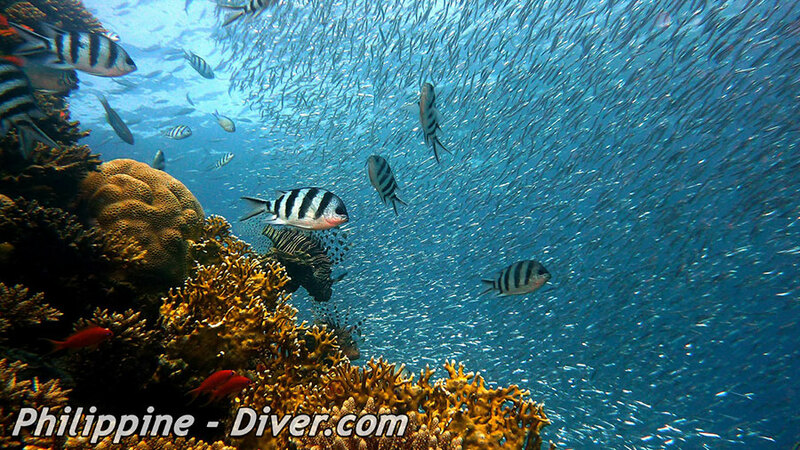 Scuba diver have a great variety to choose from. 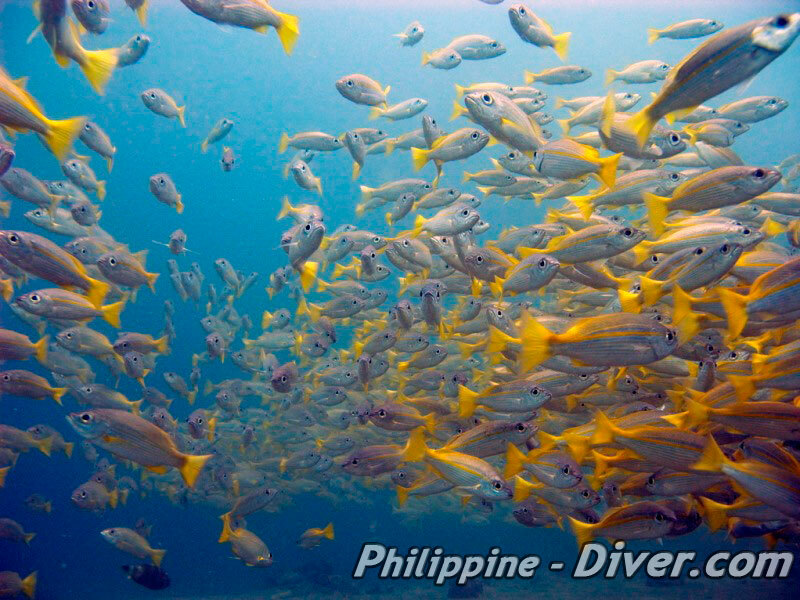 While day-trips from Dumaguete only reach the great dive spots in the south west, dive shops Siquijor can bring you to all dive sites. If it is too far for a boat ride, they simply use a multicap. 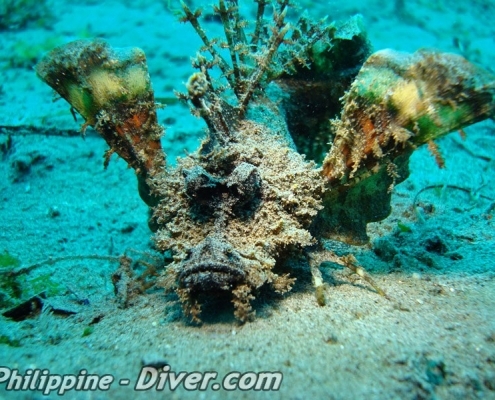 Most dive sites are accessible via shore entry anyway. 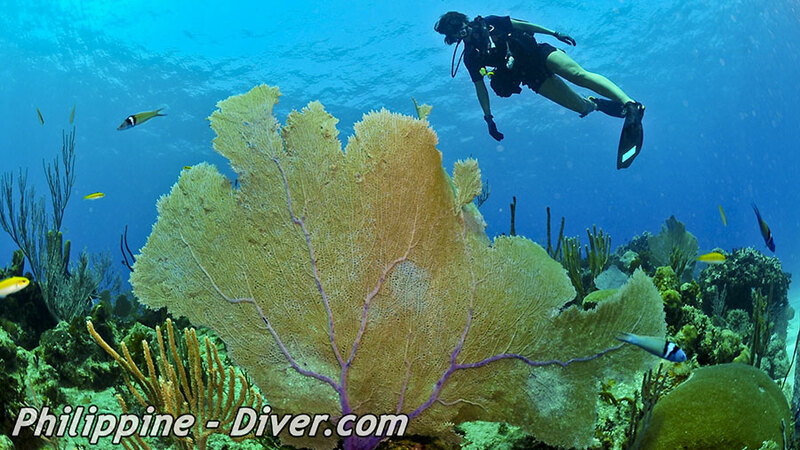 This is a beautiful dive site consisting of a shallow reef area with plenty of ledges and overhangs to explore. 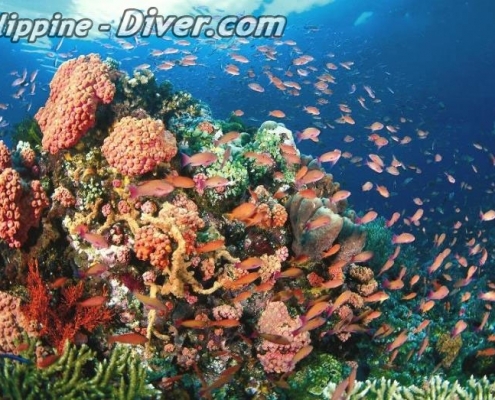 The reef leads into a spectacular coral garden adjacent to an extensive sandy slope. Snake eels can often be observed here, these fish have elongated and cylindrical bodies with a sharp tail that they use for burrowing backward into sand, rubble, or crevices. 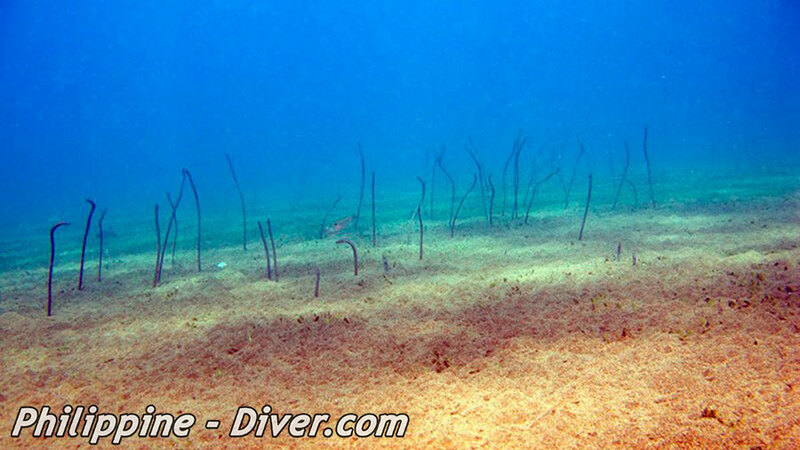 Other species to be found are Spanner and Box Crabs, Ghost Pipefish and Stick Pipefish. 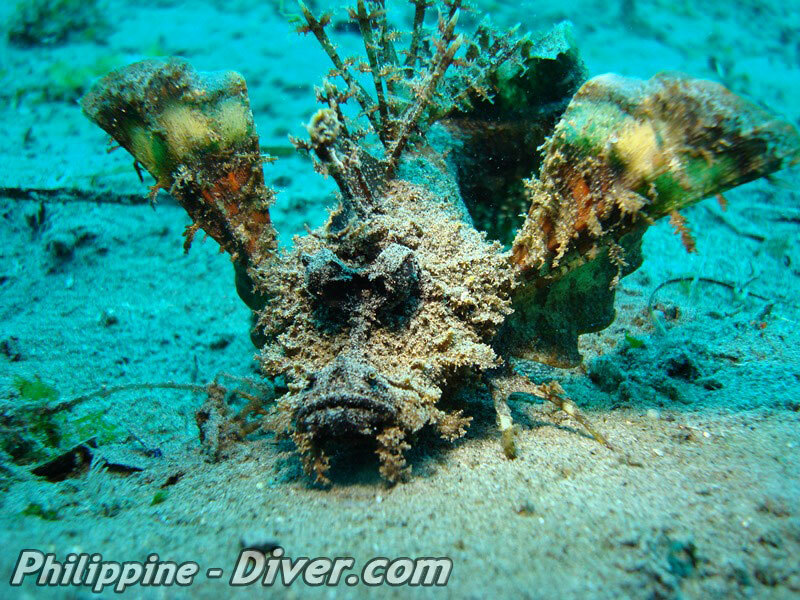 The slowest-moving fishes are the sea horses, often found in these reefs. The slowest of these, the dwarf seahorse, only achieves about five feet per hour. A knowledgeable dive guide should be able to point out lots of Nudibranchs and the occasional Turtle or Banded Sea Krait as you follow your multi-level profile up into the shallows where you may complete your safety stop. The extremely scarce Hairy Octopus has been spotted here on rare occasions. 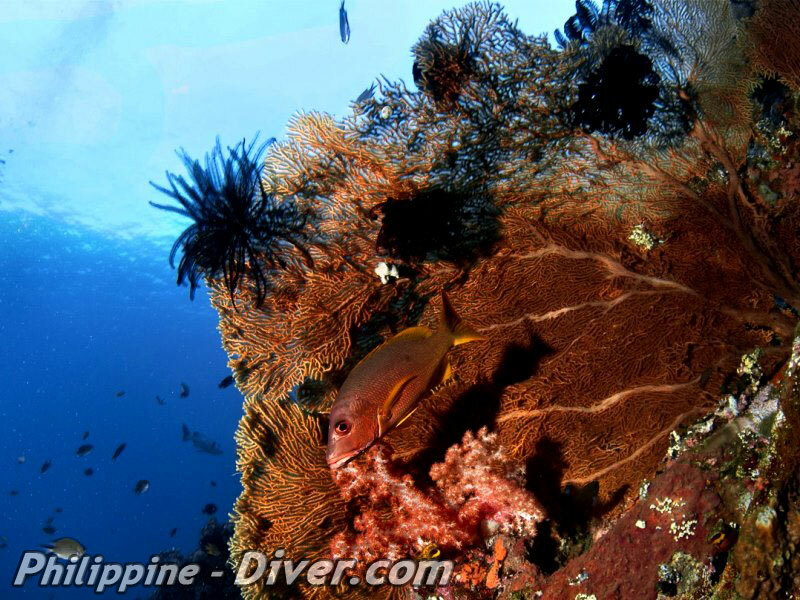 This impressive dive site is hailed as one of the best dive spots on Siquijor due to the rich diversity of marine life present. The wall begins at 7m and plunges down to depths of over 50m at which point it starts to slope and flatten out. Many different varieties of Soft Corals adorn the face and a plentiful array of beautiful Gorgonian Sea Fans add to the dazzling vista. Divers are advised to monitor their time and depth carefully as the visibility is usually excellent, this means it is very easy to slip below your intended depth. A large overhang at about 35m is home to a shoal of Glassfish, a unique fish that offers an incomparable view of the internal organs due to the low-pigment and almost clear body. Lionfish can often be observed hunting these diaphanous creatures. 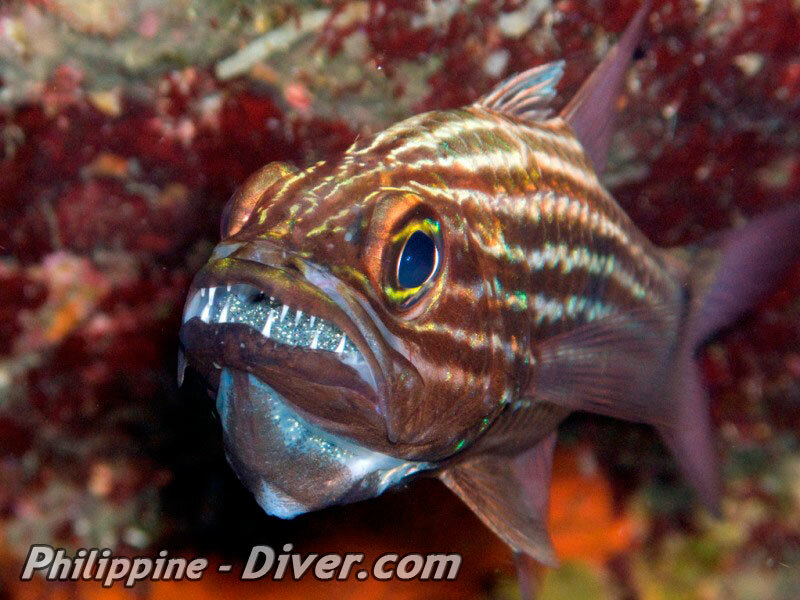 Other species to look out for are Moray Eels, Scorpionfish, Sweepers, Ribbon Eels and the occasional Cometfish. 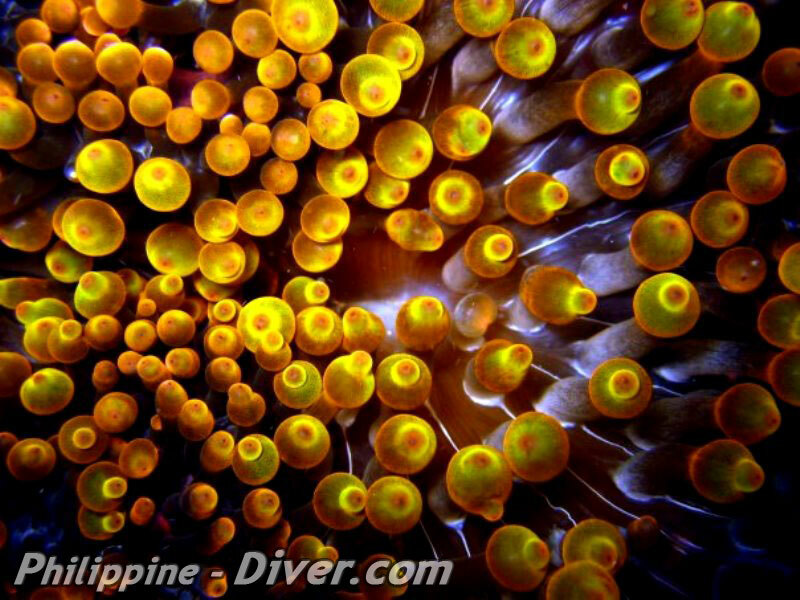 The ubiquitous swarms of Anthias and schools of Fusiliers are always to be found and macro lovers will find Nudibranchs, Flatworms and Peacock Mantis Shrimps in the crevices and overhangs. This wall dive site begins at 7m/20ft, similar to Paliton Wall Sur, and plunges down to depths in excess of 40m/130ft in places. 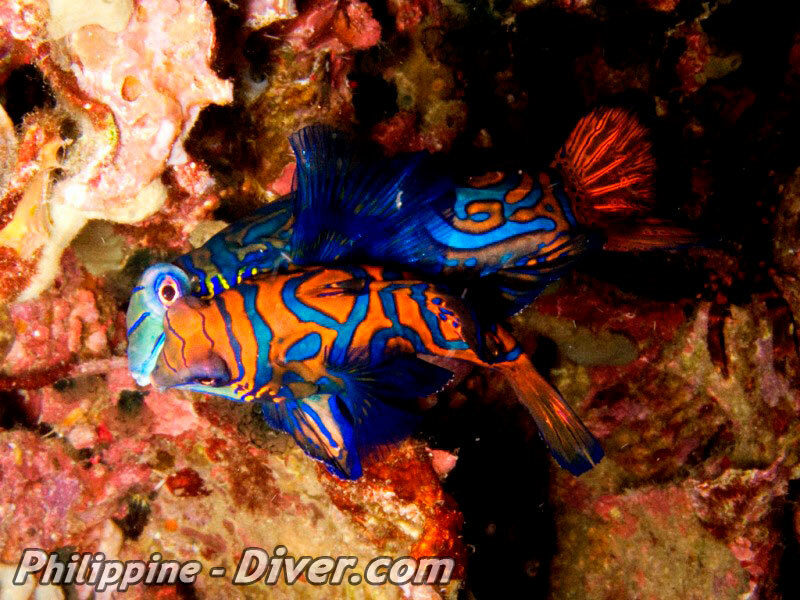 A densely ornamented Soft Coral collection hosts a wealth of many hued reef fish and you can expect to spot snubnose drummers as well as groupers in this area. 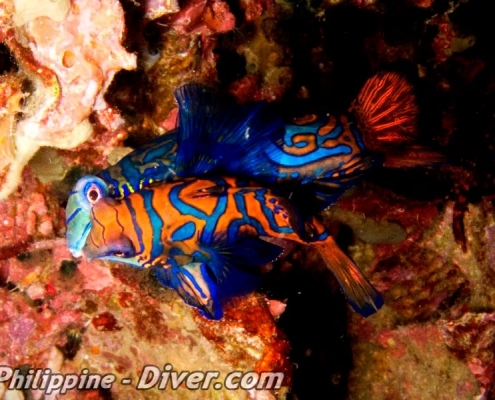 However, the highlight for many divers is the Blue Ribbon Eels that are frequently found here at the top of the wall. These vividly colored eels, a relative of the moray, bury themselves in sand or hide in rocks or crevices, only darting out to seize a tasty shrimp or small fish. Macro lovers will be impressed as there is a multitude of ledges and overhangs in which to seek out some rare and exotic creatures such as the cryptic Cometfish. Several species of Nudibranch can be seen as well as Egg Cowries, Peacock Mantis Shrimp, Midnight Snapper and Fire Dartfish. This site is perfect for all levels although novice divers will need to ensure they stay within their depth limits. 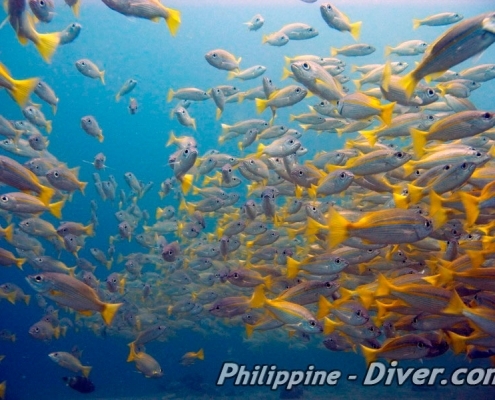 Tambisan is a relaxing dive where schools of smaller reef fish are prevalent. Large Gorgonian Sea Fans cling to the wall and colonies of green Tubastrea Corals and Black Corals trees forest the entire area. 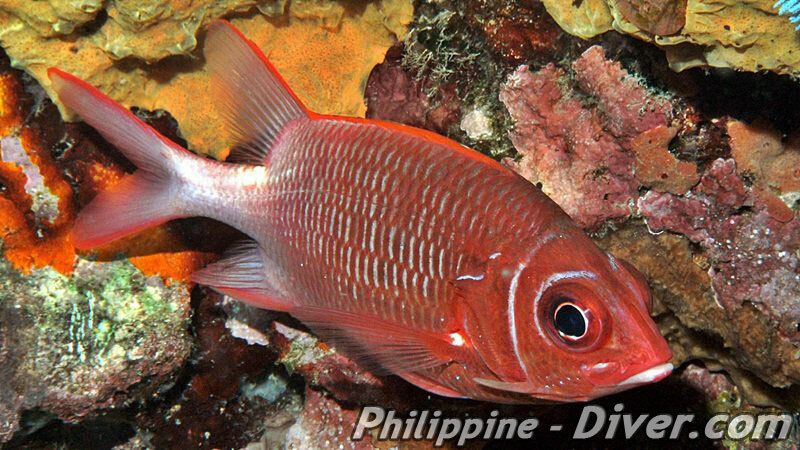 Several small caverns and crevices are home to numerous invertebrates and there are also populations of Sweepers, Squirrelfish and Soldierfish in evidence. 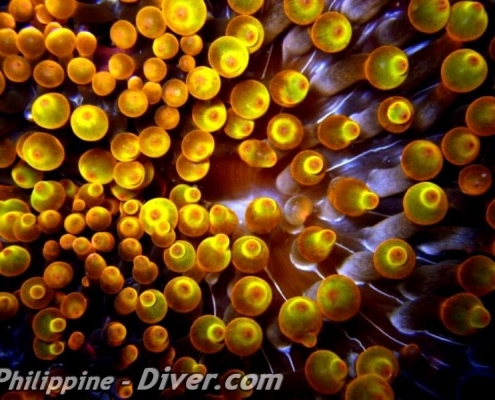 The top of the reef at around 10m is carpeted in Anemones all hosting various species of Anemone fish. Although the tentacles are harmful to other fish, these tiny creatures are among the few species of fish that can avoid the potent poison of a sea Anemone. Porcelain Crabs and Commensal Shrimps can also be located and as you descend a little deeper, you can find pairs of Fire Dartfish hovering above their burrows, seeking out their next tasty morsel. 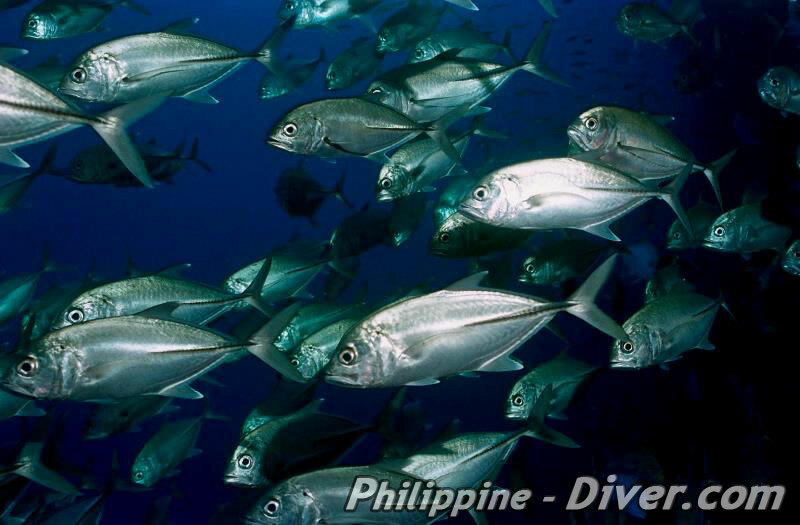 Tulapus sanctuary is a marine protected area as implied by the name. Suitable for all levels it offers easy access and relaxed diving on a flat sandy slope. Located off the north tip of Siquijor, in 1989 a large number of concrete crosses were installed to create an artificial reef and when swimming over them can be reminiscent of swimming through a graveyard. Nevertheless this is still a lovely dive as the crosses are now encrusted with hard and soft corals and offer some unique photo opportunities. The reef frequently attracts larger species and there is a good chance that you will observe big Groupers and Barracuda patrolling the area. Turtles are often spied grazing and Snappers and Angel fish are common with the occasional Black Tip Reef Shark passing through. A multitude of Blue Spotted Fantail Stingrays can be sighted on the sandy bottom or underneath outcrops. The Larena wreck is a Japanese hospital boat that was sunk in 1945 and lies at about 30-35m. The ship is very well preserved and many artifacts are still visible in the silt at the bottom. 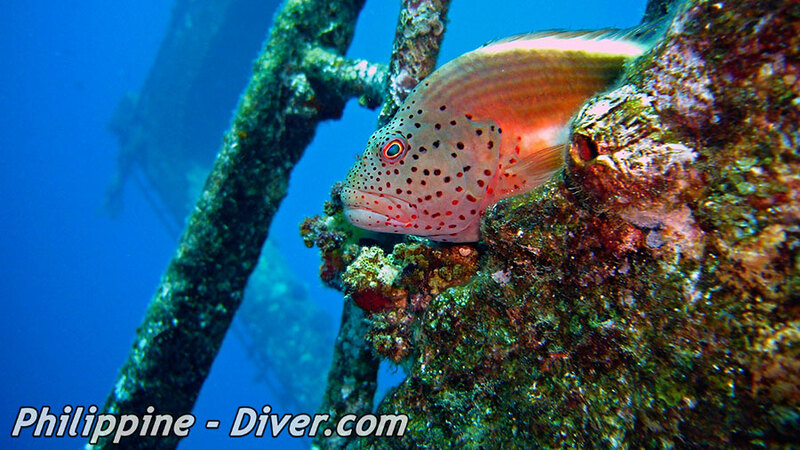 Located at the mouth of Larena pier, it can be subject to strong currents and poor visibility, therefore only advanced level divers are advised to try this one out. A great spot for seeking out Frogfish and Moray Eels and schools of foraging fish, such as surgeonfish and cardinalfish, can be observed swimming around feeding on tiny zooplankton. 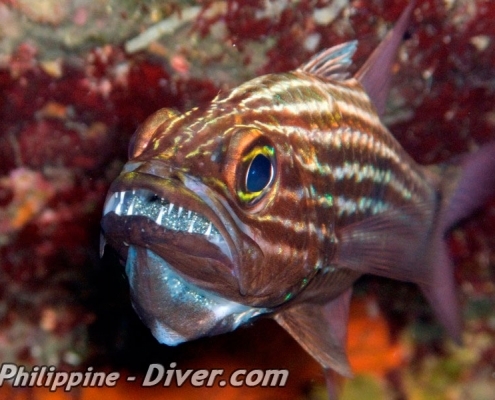 As fish are not able to groom themselves, they come here to have their parasites nibbled away. 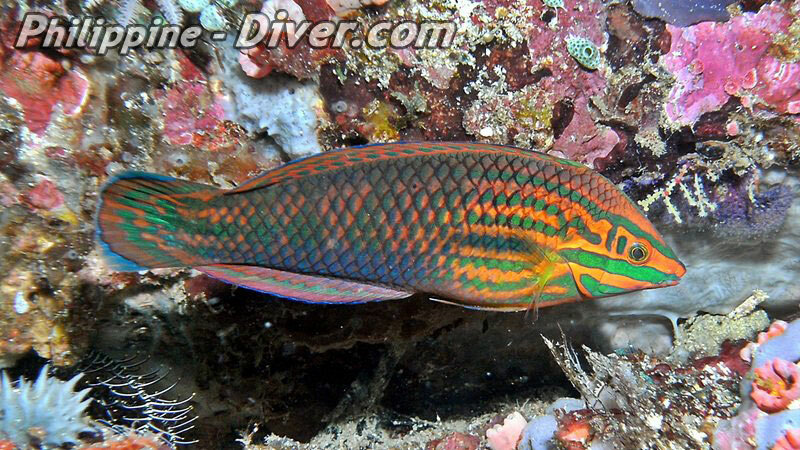 The resident fish doctor and dentist on the reef is the bluestreak cleaner wrasse and these fish can be observed nearly everywhere in these waters, fascinating to watch. As the name suggest, this site is a beautiful submerged island encrusted in Hard and Soft Corals as well as Whip Corals and Barrel Sponges. The maximum depth here is 40m and is therefore not suitable for novice divers. 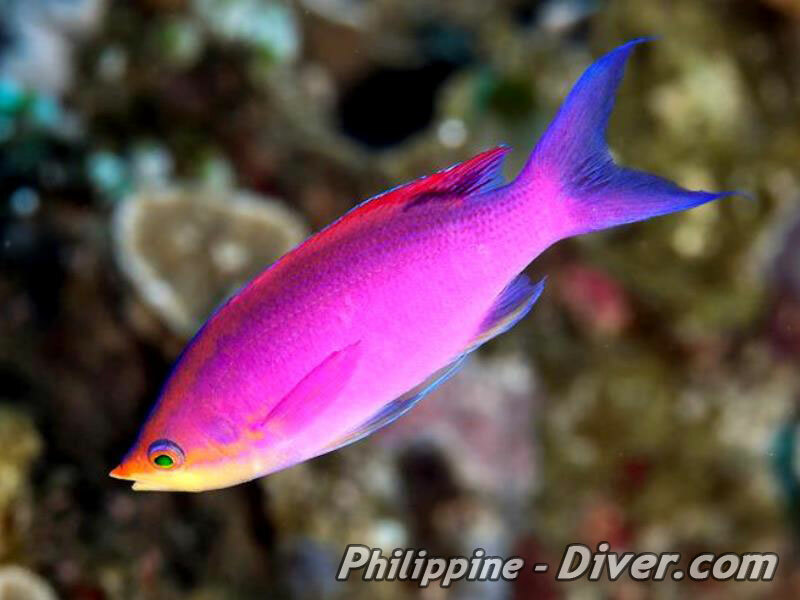 Many different species of colorful reef fish can be observed here darting in and out of the nooks and crevices. Macro lovers can find Nudibranchs and Flatworms hiding amongst the coral and large schools of jacks can also be seen patrolling the reef. Very occasionally a large pelagic may pass by such as a Reef Shark or Tuna and it is often possible to see Manta Rays and Mobulas (Devil Rays) at this site. Prone to strong currents, the island is reached by descending down a mooring line and should only be attempted by the more experienced diver. 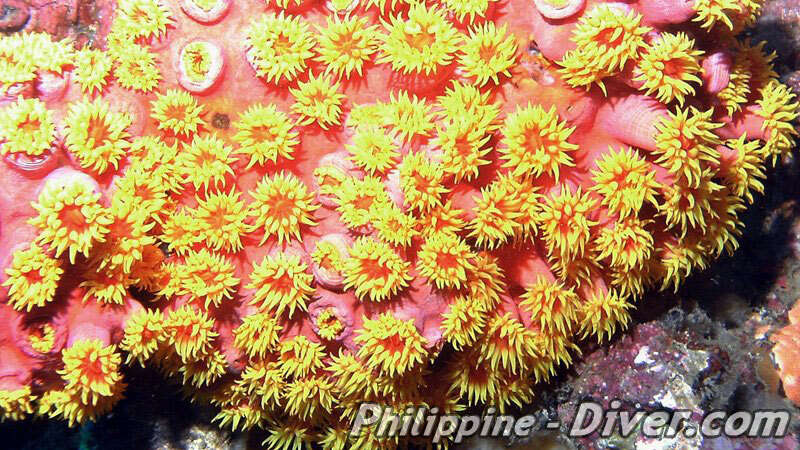 Solangon is a very pretty dive site that begins as a gentle sloping coral garden which leads to a short but interesting wall blanketed in Hard and Soft Corals. The wall drops off to 45m, however, the most interesting parts are to be found above 15 meters. A great spot for beginners, this area offers plenty of marine wildlife to watch. 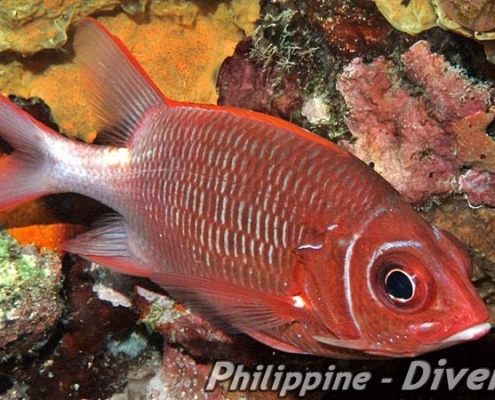 Schools of tropical reef fish are abundant and Jacks and Pufferfish are regularly sighted. Typically the current is gentle but constant which allows for a relaxing drift dive. Feeding Turtles can be observed here as well as a healthy population of Moray Eels, Lion Fish, Rock Cod and Barracuda. Whilst hovering over the bottom you should be able to identify Blue Spotted Rays, Sting Rays as well as several elevated coral formations and barrel sponges. 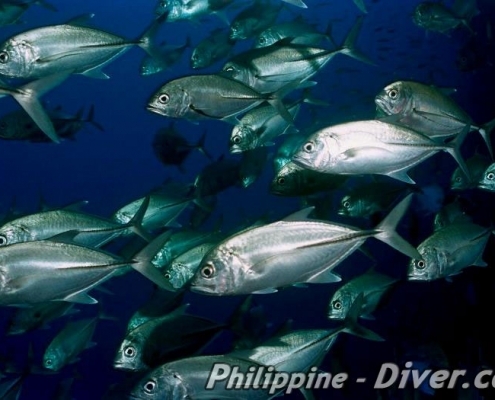 Established in 1989, the Tubod marine sanctuary covers an area of more than 7 hectares. Coral reefs teeming with marine wildlife are interspersed with sandy areas and extensive beds of seagrass. 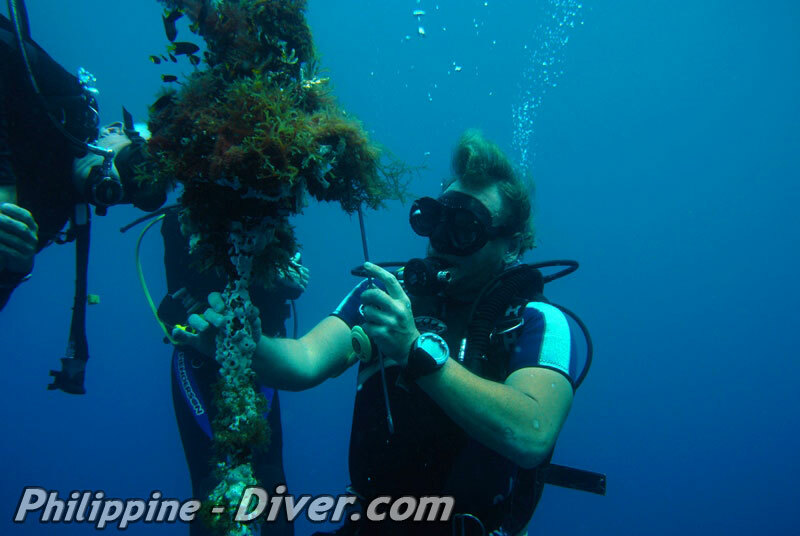 Easily accessible from any shoreline on the island it is therefore ideal for novice divers as long as they stay within their certified depth. The sanctuary provides a nursery for juvenile reef fish which ensures that fish stocks are constantly replenished and this abundance inevitably benefits the adjacent reefs. 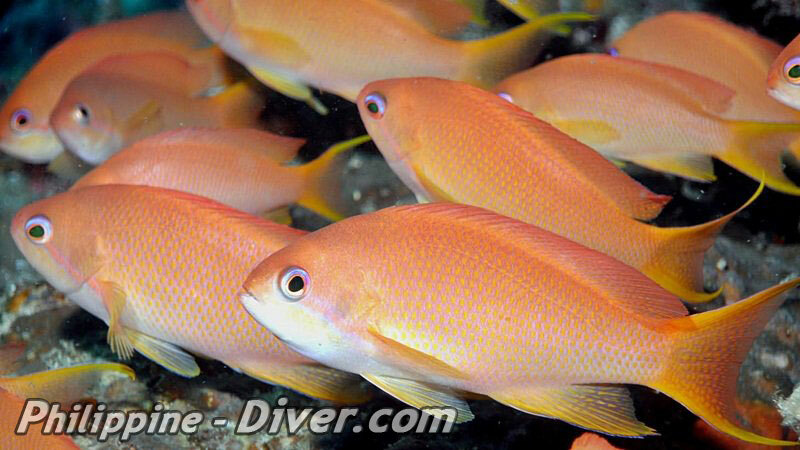 Schooling fish such as Anthias and Fusiliers, as in most reef areas, have developed remarkable displays of choreography with which to confuse and evade predators and this engaging behavior is captivating to observe. 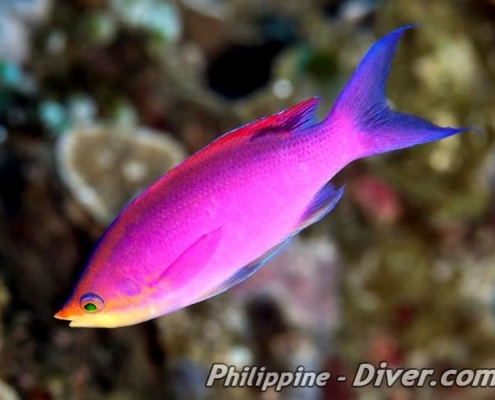 Sea snakes, Cuttle fish and Barracuda are regularly spotted and in the deeper parts you can find colorful Parrot Fish, Razor Fish, Blue Spine Unicorn Fish and the occasional feeding Turtle. 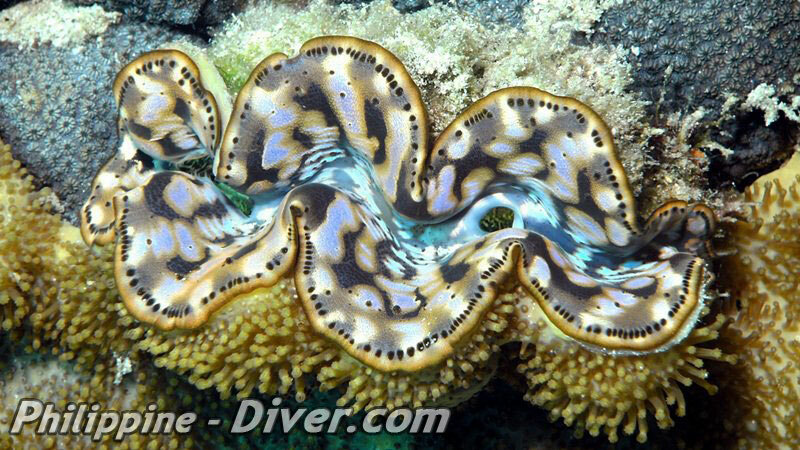 Giant Clams are scattered about the sand and schools of Groupers swim among the corals, 173 of the Filipino species have been documented as being present here making it one of the most favored sites in this area. 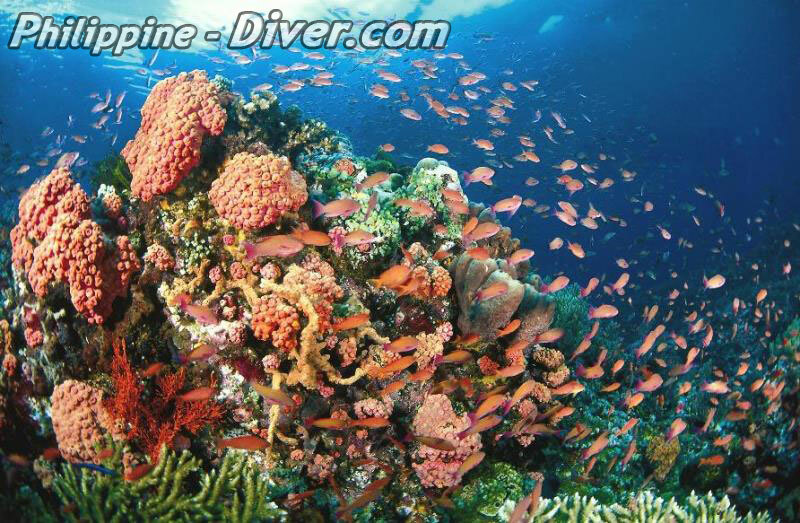 Sawang dive site is characterized by having large boulders encrusted with a variety of Soft and Hard Corals. The bottom composition slowly changes to a sandy slope and that in turn leads to a small wall. For divers with good buoyancy control, the highlight of the dive is an interesting swim-through just big enough for one person to pass through at a time, during which you may encounter many different types of marine wildlife. Maximum depth is 18m which makes it an ideal spot for beginners. 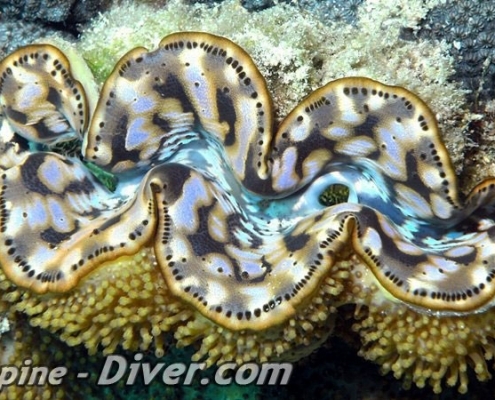 A wide array of Giant clams are present and macrophiles can find tiny Clownfish, Scorpionfish and Jawfish in abundance. Turtles are often spotted grazing happily and photographers will find many interesting subjects to frame.